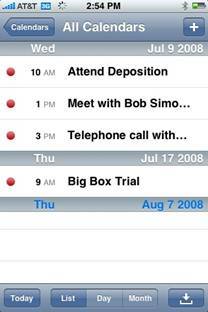 Miami, August, 2008 – PerfectLaw® PLSync Software now synchronizes with the iPhone. PerfectLaw® just announced the official debut of PLSync for the iPhone. In addition to using Blackberries and other PDA, users can now utilize the PLSync Exchange Synchronizer to synchronize contacts and appointments with the Apple iPhone. 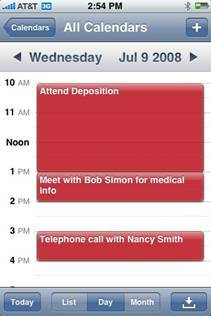 Appointments can be easily viewed in the Day, list or monthly view. Appointments are entered in either PerfectLaw® or Outlook®. Then, the appointments are immediately synchronized, real-time, and then synchs wirelessly with the user’s iPhone®. As an added feature, users can also synchronize their contacts. PerfectLaw®, a leader in the All-in-One® office automation marketplace, combines matter, contact, and document management in the Front Office with full-featured Back Office billing and accounting. PerfectLaw® is a true 32-bit SQL software product that provides the latest innovations to law firms and legal departments nationwide. PerfectLaw® offers wireless connectivity, and collaborative case information (peer-to-peer) technology. It is the only fully integrated suite that doesn’t require integration with other products for front and back office operations. For more information, visit www.perfectlaw.com. Apple® and iPhone® are registered marks of Apple Inc.
Outlook® is a registered mark of Microsoft.